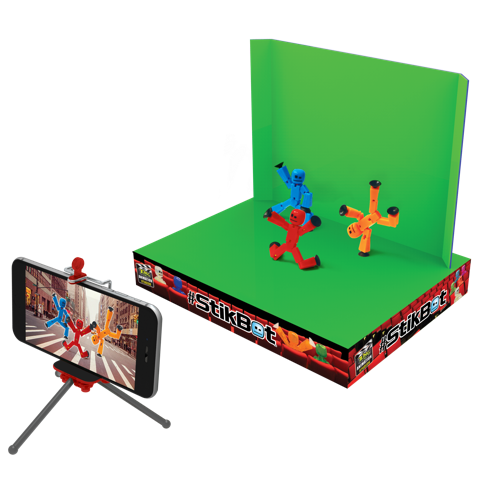 For ages 4 and up Zing Toys has released StikBot which is the world’s first social media sharing toy, with the capacity to shape your imagination into endless possibilities. With StikBot’s ability to mimic human motion, StikBot can be whatever you want; from the mischievous little critter that loves to steal your candy, to the break-dancing phenomenon that can’t help but bust a move. I was sent the StikBot Studio Pro which comes with Z-Screen Magic that you use with the Zing Studio App; which is green or blue that allows you to use your own special moment of theme to create your next masterpiece and also a tripod to hold your phone and 2 StikBot’s in the colors red and orange with black suction cups on the hands and legs.. You can buy more StikBot’s which I was also sent in the colors red and brown these have clear suction cups on the hands and legs. My Opinion: This is great if you are looking to start your own YouTube channel of practice being an editor or director in the film industry. The possibility is endless on what you can do with StikBot and what you may create with your mind. I think it is a great idea for kids to expand their imagination. StikBot is taking over the world! Get in on the fun and show us what you’ve got! Ozwest, Inc. is sponsoring the “Make Stikbot a Star” film contest with $20,000 in cash prizes!